I had a 2 hr layover in San Diego. Using my Amex Platinum card, I had access to the Airspace Lounge. 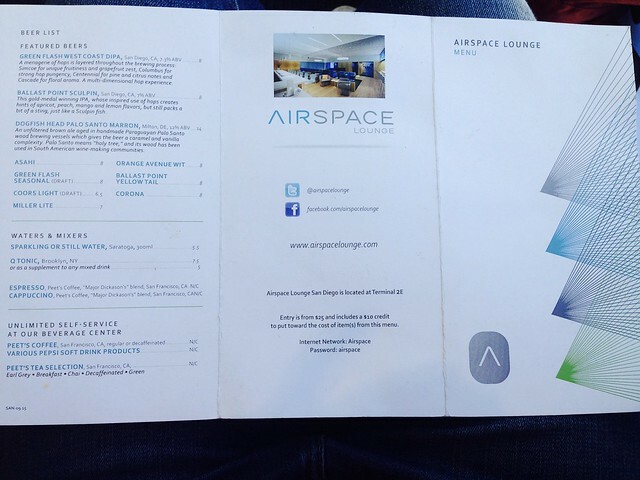 I *think* the Airspace Lounge is a third party lounge, which caters to a bunch of different airlines. So, depending on how you entered the Airspace Lounge, you’d get a fairly different service. For instance, those who entered on a premium ticket flying Japan Airlines (JAL) had a menu selection involving ramen. 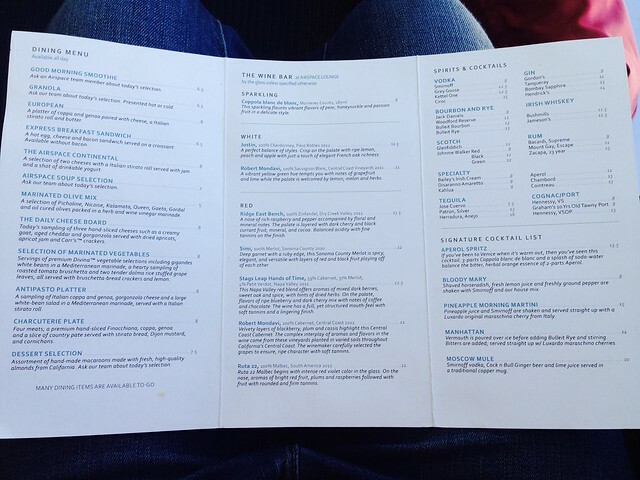 Using Amex Platinum to enter, I was given a different menu with different items. I could have entered using my AA premium ticket, but the front desk agent suggested I use my Amex Platinum, as that entry would come with a $10 credit to spend on items. I wasn’t hungry at that point, but $10 would probably get you a small food item. Sodas and snacks are free. I simply got a fruit smoothie for $6. 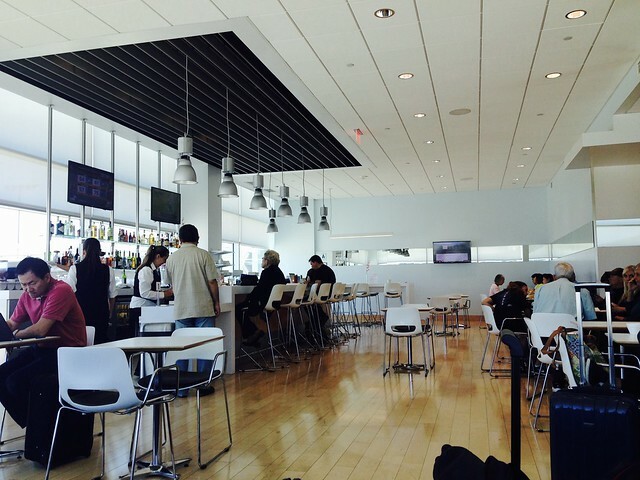 The Airspace Lounge has a high ceiling, and tarmac views. Its white theme also gave it a very bright and airy feel. There are several armchairs alongside the windows, and there are some dining tables closer to the bar area. There are many power outlets located between the armchairs. I had the misfortune of being unable to locate a power outlet that actually worked (I tried a few – other seats were occupied). The menu looked pretty good, although I didn’t try the food. It’s refreshing compared to the usual selection available at UA/AA lounges, and they were made after you place an order at the bar. I only ordered a smoothie, which was a Naked Juice smoothie. Slow…. Painfully slow. That’s my main complaint. 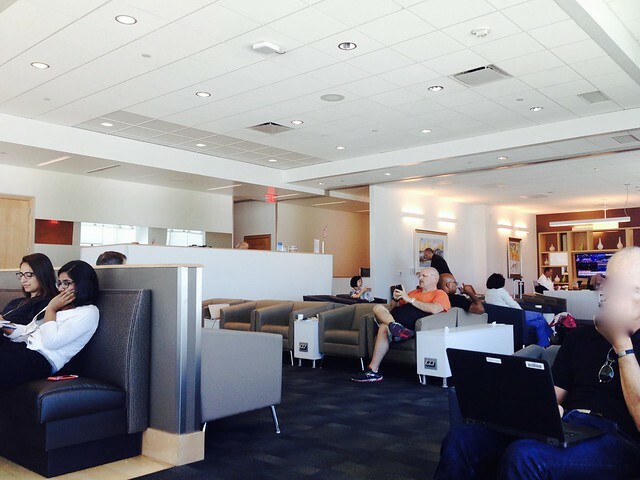 It’s an above average domestic lounge, but don’t rely on the wifi speed or availability of working power outlets.